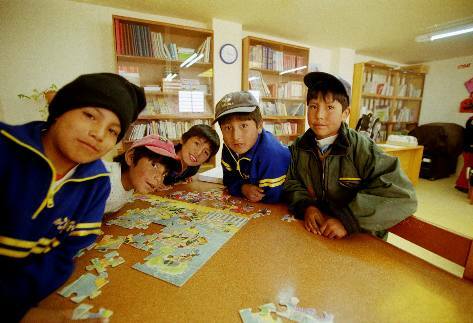 The Comunidad Terapéutica Puntiti was born as a social urgency to respond to the attention of the abandon children in Cochabamba - Bolivia with intellectual and multiple disabilities. For this purpose Bolivia delegates to the Congregation of the Sisters Hospitalarias del Sagrado Corazón de Jesús. Our mission is aimed towards the attention, integration and social inclusion, work ethics, family through integral rehabilitation, especial education and programs of sensibility and social capacity to become GOOD GOD NEWS FOR THE INTEGRATION AND BETTERMEN OF TODAYS MEN. El Alto – La Paz – Bolivia. This is a center that serves to a significant number of social disadvantage children and adolescents living in the periphery of the city, in the south side of district 3. The areas “7 de Septiembre” and surrounding areas are populated by families with scarce resources that, in some cases they find themselves in the threshold of misery. • This institution started in 1997 as a Kürmi Kiswaras project. • The Kürmi Mururata center was added in the year 2000. • It wa stablished as Burgosmarka in the year 2004. Our reason is to be a forming institution, is to train each one of our recipients that by the precariousness of the socio-familial environment, cannot continue in a satisfactory form their regular educational process. Prevent children and youth from becoming "children, adolescents and young people of the streets", by providing them with comprehensive promotion and training. Organización formada por doctores y enfermeras voluntarios que viajan a Cochabamba-Bolivia para operar a personas de bajos recursos económicos. Solicitan una donación de US $50.00 por operación. Organization formed by volunteer doctors and nurses to travel to Cochabamba, Bolivia to operate people of scarce resources. MIMA solicits a US $50.00 donation per operation. 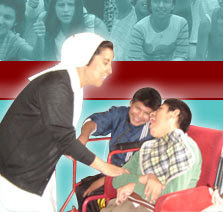 AMANECER was founded in 1981by the Catholic order of the Sisters of the charity of Saint Vincent de Paul. AMANECER offers protection, orientation, and training to children, young and women that live in the streets in a friendly and loving environment to counter their experiences past. The program promotes their physical intellectual, spiritual and social development, the goal is to integrate the person back into the community with a higher level of self-steam and capacity to economically provide for themselves. Center of support for deaf persons. “PATITAS DESCALZAS” A not for profit group of friends, a group of young people United by the love for animals and the conviction that, together, we can do a lot for them.